Wear OS watches tend to feel quite similar. Unlike Android phones, they don’t have radically different interfaces that give models different personalities. This makes the watch face you choose all the more important. It’s the root of your watch’s character. 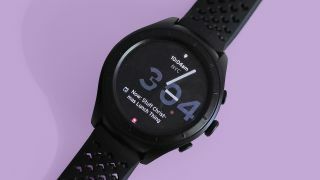 You’ll find thousands of watch faces on Google Play, but thanks to its limited discovery features, finding the gems can be awkward and time consuming. That’s why we’re here to help, with a rundown of some of our favorites, all of which you’ll find below, along with links to their store page. If you know ustwo, you’ve probably tried its games, like Monument Valley. However, ustwo is also a design studio, one that has devised some of the most interesting smartwatch faces available. Download its ‘Watch Faces’ app and you’ll find its most artistic and unusual designs. This app was released at the tail end of 2014, but still contains many of Wear OS’s most interesting faces. The gang of 15 are so stylish and confident, it’s hard to pick just one. But Invert is one of the most accessible. Purple and bright orange, the colors invert as the seconds hand ticks across the face. There’s no extra data and no complications, but ustwo is a master of distinctive style. ustwo deserves one more plug in this list, for its third collection of watch faces. These are the most conventional, but also offer the most customization. Stellar is part of ustwo’s Looks app, which focuses on faces with space for Wear OS complications, the data widgets that let you choose which data fields end up on your watch. It’s an analog face, with three spots for complications. There’s none of ustwo’s left-field design style here, but it’s eminently tasteful. This watch face has the look of a serious diver’s watch. But it doesn’t go in for fake metallic finishes you’ll find elsewhere, and avoids the uncanny valley effect of a face that tries and fails to look ‘real’. You can try Rawmariner for free, but if you pay for the premium version you can customize the color and use the timer feature. Just tap on the watch face and the timer view pops up. Facer is perhaps the best-known platform for smartwatch faces. You install it like a normal Wear OS watch face but can then use the Facer phone app to choose the actual design. The Facer platform offers thousands of looks. Some are free, others cost a dollar or two. Folds is a good place to start if you want something less than completely conventional. It’s free to download and use, and arranges a bunch of info fields onto a series of virtual pieces of colored card. You get the time, date, the battery life of your watch and phone, the date and weather. And somehow it doesn’t appear at all cramped. Magic. Here’s another of our Facer favorites. Flight A3 Classic is one many roundly realistic-looking watch faces available from the Facer store. You get a clear, bold face, the date and a second mini face inside that shows you the time in 24-hour style. Y’know, in case you live in a window-less house and have jet lag so bad you can no longer tell if it’s day or night. This is a good choice if you want to give your smartwatch a touch of Swatch-like analog charm. Modern Times by Pluto is a minimalist analog face with curvy hands and fonts, for a tasteful but friendly appearance. There are extra data fields here, but while they look like Wear OS complications, they are actually custom parts. This lets them fit more perfectly into the watch face, but means you don’t get control over what bits of info are shown. However, many of you should be happy with the date, and the dual phone/watch battery indicator on offer. Here’s one of our favorite clean and simple watch faces. Primary Basic is a digital watch face that fits in the date and the battery life as well as the time. However, those extras are displayed in grey, letting the time take center stage. The pleasantly rounded font isn’t retro and doesn’t try too hard to look deliberately styled. However, the characters’ curves and their position on-screen give Primary Basic an accomplished, professional appearance. This may not sound that important, but there are many amateurish Wear OS watch faces on Google Play. Pujie Black is a smartwatch face platform, not just a single watch face. Wouldn’t know that from the name, would you? It’s not free, but in the default package you get a bunch of faces, effectively for the price of one. Many styles are on board, but we settled on the no-nonsense Brownstone. It is a clean and simple analog face with spots for three Wear OS complications. The potential of Pujie Black is immense, as it also lets you create your own faces. The key to making a watch face feel unusual, rather than just looking so, is the mechanic used for the passing of seconds. Timr has this nailed, with what looks like a ruler scrolling along the bottom to show the granular passage of time. It’s quite handy too, if you need to frequently (but casually) see how long things take. You can also customize the color of the highlights, picking from 10 different shades. This is a watch face that seems inspired by comic books, with bold outlined fonts and punchy colors. There are no complications here unless you pay for the premium version, but even with the free one there’s a level of interaction. A double tap on the clock can be used to start up the stopwatch, timer or alarm clock. One of our favorite parts here, though, is the look it uses for the always-on display. The monochrome version is, if anything, better looking than the standard colored-in one. Most chronograph-style watch faces only borrow the style of their ‘real’ watch inspirations. Add in slightly dodgy drop shadow effects and faux shiny parts, and they can seem almost embarrassingly try-hard. Cronosurf Wave is not only one of the most authentic digital alternatives to big wrist timepieces visually, it is also one of the most ambitious Wear OS faces in terms of function. You can set timers, there are multiple night modes, and even one that shows your compass bearing, using the reading from your phone. You’ll need to put a little effort into learning its functions, though, as Cronosurf Wave has its own UI style, rather than using generic complications. Most of our picks have either aimed for a traditional look or one with quite a minimal style. Interactive Rich Watch Face may prove to be more of an audience divider. It has a hint of steampunk styling, or perhaps that of an old luxury car’s dashboard. If the default two-tone color scheme is a bit too rich, you can switch to a white, silver or black theme. Tap the center and the face shows you your daily steps and battery life as well as the date.